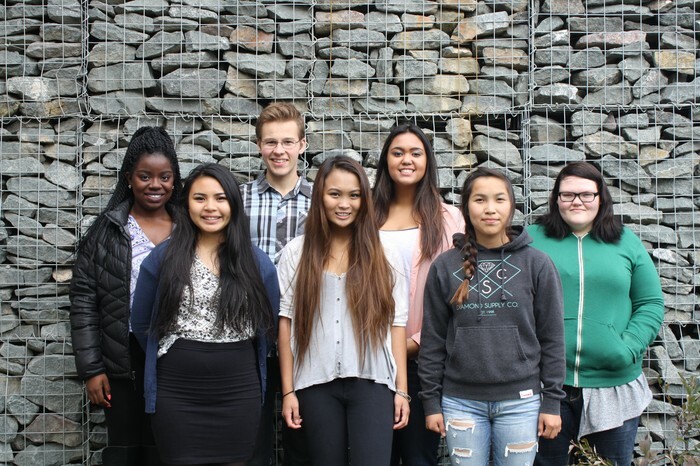 The Youth Alliance for a Healthier Alaska (YAHA) is a group of diverse and energetic teens, ages 14-18, from across the state of Alaska who are interested in health and shaping how our state responds to youth health issues. YAHA is a Youth-Adult partnership! The Youth Alliance for a Healthier Alaska (YAHA) is a diverse group of energetic teens ages 14-18 from locations across Alaska: Sitka, Anchorage, Unalaska, Ketchikan, and Naukati Bay. 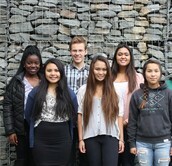 The advisory helps shape Alaska’s response to youth health issues and develops youth-led community level interventions. 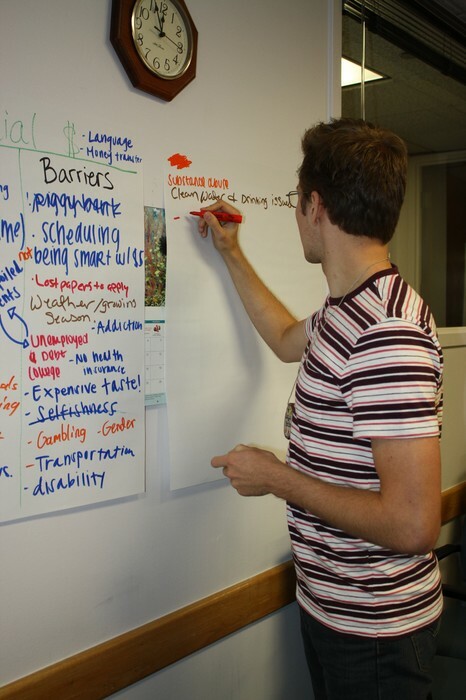 YAHA conducted their statewide community health strategic discussion utilizing the Six Areas of Health Literacy curriculum created by the New Mexico Department of Health, Office of School and Adolescent Health. YAHA members created a panel style presentation on Why Teen Voice is Important and how to get involved. Where Did YAHA Come From? YAHA was established in 2009 to advise the Adolescent Health program and other Division of Public Health programs. 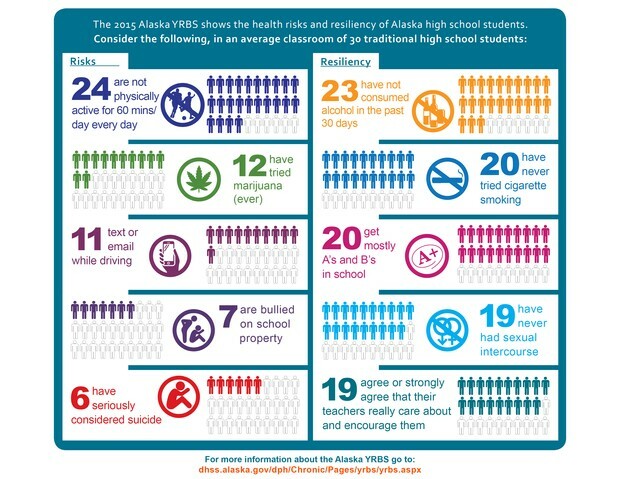 In the 2011 school year YAHA began designing interventions, with support from community agencies, to improve the lives of adolescents in Alaska. 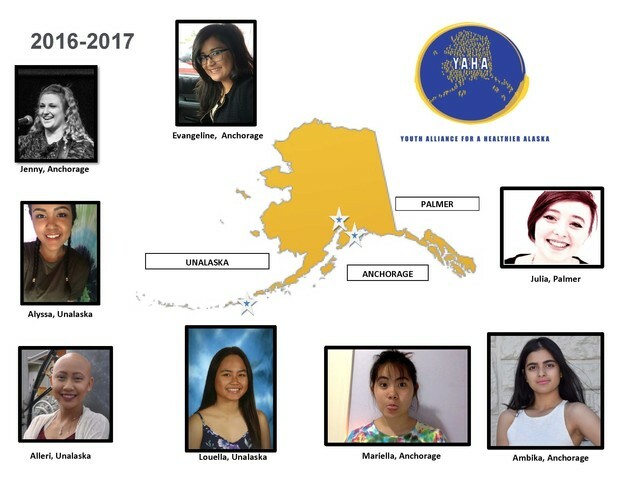 The 2016-2017 YAHA application process closed in May and we are happy to report seven new members from Anchorage, Palmer, Unalaska, with one returning member. This year’s focus continues to be offering professional-level youth feedback and engaging a broader base of community health partners. We will be looking at the 2015 Youth Risk Behavior Survey data to drive our community action projects. 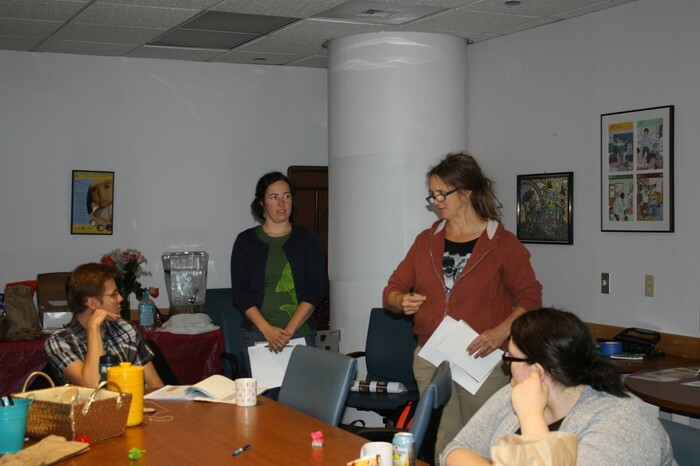 YAHA conducted their community health strategic planning a little differently this year utilizing the Six Areas of Health Literacy curriculum created by the New Mexico Department of Health, Office of School and Adolescent Health. After defining the word “health,” the team agreed that the World Health Organization's definition, “a state of complete physical, mental and social well-being and not merely the absence of disease” along with being of healthy mind, body and spirit are adequate descriptions of health. At the orientation, each member listed characteristics of the six areas of health, along with any barriers that can get in the way of optimal health in each area. The Social/Relational health area is about building healthy and strong connections with people around you like your peers, family, caring adults at school and in your community. It’s about showing others respect through your words and actions without judging or stereotyping them. YAHA brainstormed actions that they believe assist in developing social and relationship health: being happy, effective communication, being encouraging, having trust, being honest, making time for friends and family, having family support, having a pet, having positive peer pressure, and developing relationships. 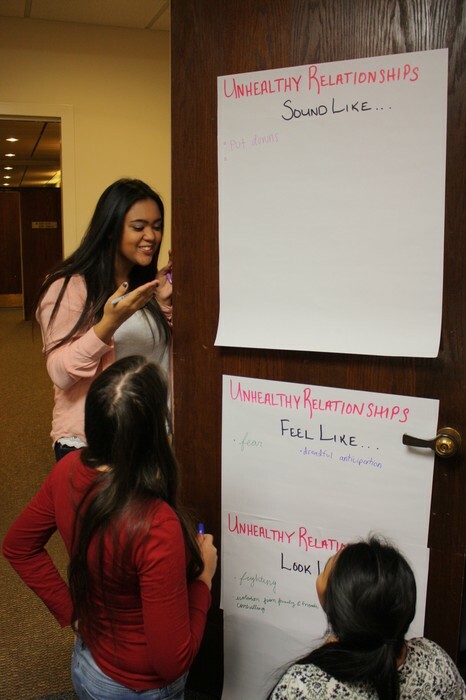 YAHA members also noted their perceived barriers to healthy relationships and social well-being: school/work, distance, other relationships, jealousy, social acceptance, inequality, making time for them, trust issues, busy schedules, attitudes, stereotypes, bad vices, inconsistency, controlling behaviors, negative peer pressure, and poor examples of relationships. To answer this question, the members took a moment to write in their journals and answer this question: What are issues affecting the health of other teens in your community? Each member pre-marked their stickers with the first letter of the community you represent S- Sitka, F-Fairbanks, A- Anchorage, C-Craig, U- Unalaska, and K-Ketchikan. 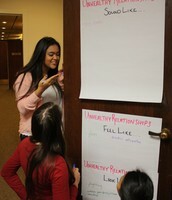 Once the members had their list from their journal distilled to their top five health issues they were asked to write the biggest issues for teens in their communities on the large post-it in the room. If someone had already written down their topic, they were asked to place a green dot next to it. In addition, they had three additional dots to add their emphasis on the most serious issues. After our review, we observed which top issues were happening in every community. Note that Unalaska had more representation. Potential solutions: activities utilizing social interaction to boost understanding and practice of healthy relationship characteristics, including recognition and response in unhealthy ones. Additional: Sharing activities to reduce stress substance abuse prevention tactic. Inclusion of faith and spirituality was also mentioned as essential. Risk Factors: Poverty, maltreatment, early sexual debut, instability in parental and home relationships. Protective Factors- education, knowledge of what a healthy relationship is and what it isn’t. Learning that not all healthy relationships are the same and they don’t all have to function the same way. Skills: develop trust and support each other; create an atmosphere of open-mindedness (to be aware of different ideas); emphasize assertive and constructive communication; healthy relationship reciprocation and knowledge of expectations of the partner; understand what abuse is and the signs; if you’re physically stronger person in the relationship and they hit you don’t hit or fight back, just leave if you can; keeping a plan to leave and initiating it at the first sign of abuse, increase awareness of the consequences in staying in an unhealthy relationship. If abuse is happening, seek help, it's not your fault: http://www.andvsa.org/shelters-and-services/#. Join us to promote youth voice and engagement! We actively seek out collaborations with youth-serving health organizations that want to work with young people to improve their reach and effectiveness. In addition, each YAHA member selects a community health organization to interview for their community action plan, and in turn they learn about the services the organization offers in their community. Collaborating with YAHA is a great investment, especially because many of the members plan to pursue careers in health. YAHA at Lead On 2015! 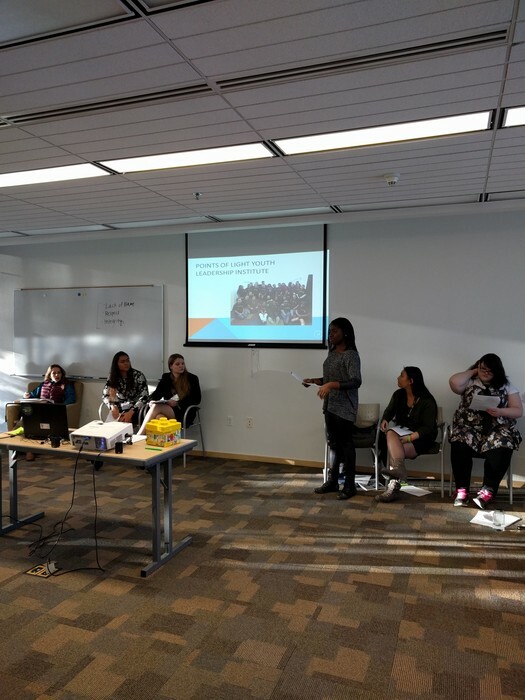 Six of our esteemed YAHA members worked to create an ignite-esque presentation for Lead-On focused on emphasizing the importance of youth voice and how youth can get involved. Cassie started us off with an inspirational piece about why each youth voice needs to be heard, and Jess talked about who YAHA is. 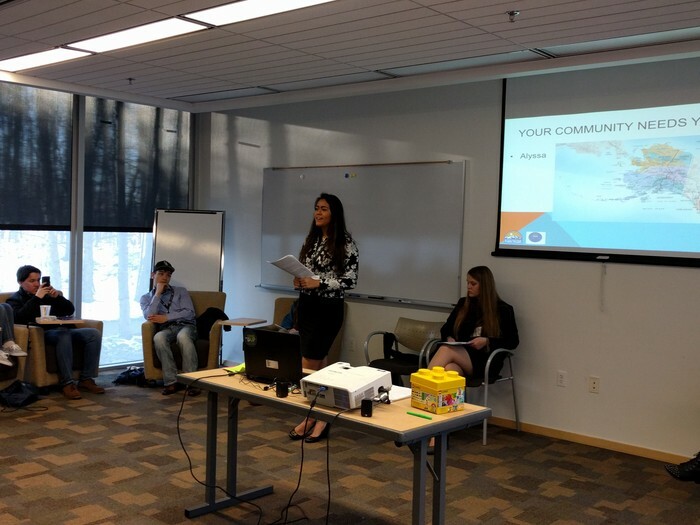 Kayla presented next on what YAHA does, Alyssa covered the importance of community involvement, JaLesa described how youth can get involved in YAHA, and Lynette gave examples of activities that youth can do in their community to make a difference. During Lead-On, the aforementioned YAHA members participated in many workshops on community initiatives, self-empowerment, project planning, self-expression, healthy relationships, leadership and pre-views of effective interventions that have been done at the community level. At the December member meeting, YAHA was asked the following questions to assist in community action planning. What workshops were the most helpful and why? Peaceful Conflict Resolution: Using "I statements", reducing blame for perspectives in relationships. Preston Pollard's presentation about creating our story and how we wanted to change it. The Pre-Summit on Healthy Relationships & Sexuality, talking now and often. What information, resources, approaches and community interventions did you learn about that could be helpful to our Community Action Project on addressing Unhealthy Relationships? The seven steps for conflict resolution. Healthy relationships and sexual health are hard topics to talk about, I really want to just get to the point where we can actually talk about it. There were lots of resources, but not one that stood out in particular. What creative approaches or innovative ideas could YAHA utilize during our community action project? Ask questions of the audience in presentations, include them in the conversation. Peaceful conflict resolution and relationship skills. What Lead On experience or quote will stick with you from your experience at Lead On? Watching people around me break out of their shell and grow in confidence. The little kid called Kwethluuk Obama. Open mic, Tieren did three stop-motion animations, he's super dedicated to his art. Happy everyone was able to experience the conference and take back that experience back home and be more open at home. Each new community partner starts by contacting the coordinator, Jennifer Baker. Ms. Baker will ask questions about the partner’s project mission, advisory goals and project timelines. Together, an advisory goal is defined and 3-4 questions are developed for discussion with YAHA. Next, the community partner either attends a YAHA meeting in person or by teleconference. The community partner will have about 15 minutes to provide an overview of their program, project, or campaign and about 30 minutes to discuss questions with the advisory group. After the meeting, YAHA sends an engagement summary and schedules a follow-up meeting, if needed. After the engagement is complete and the community partner’s goals are reached, YAHA requests community partner feedback to process the experience. Lastly YAHA request’s a review of the final product if the community partner decides to incorporate youth feedback. Six YAHA members graduated in 2016 and are heading out on paths of adventure and greatness! Please help us celebrate their unique trajectories and personalities by clicking on their photos below to read their Senior Debrief Interviews. Cassie graduated on June 1st in Ketchikan. 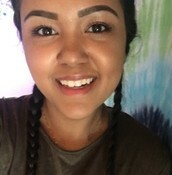 She is heading to the University of Alaska to acquire a degree in Social Work and eventually work for Child Protective Services. She thinks that a recipe for success in high school is , "don't procrastinate like I did. Seize every opportunity, especially ones that can help you in college." Her experience in YAHA helped her gain, "a broader sense of responsibility for and to my fellow Alaskans." Her advice to future YAHA members is, "Never say "I'll do it tomorrow." Success doesn't live in tomorrow. It lives in today, and it has no intention to move. You've been accepted into YAHA, which means we saw something in you that signaled your potential. Prove that our instincts were right! 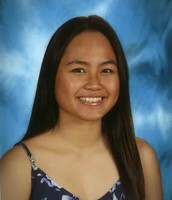 JaLesa graduated from East Anchorage High School on May 11. 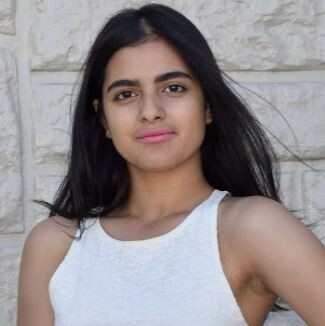 If she would have done high school differently, she would have, "focused more my freshman and sophomore years to have a higher cumulative GPA so I could go out of state my first year for college." For other high school students, she suggests that in order to be successful, you have to, "stay focused and don’t feel like you need to change just to be involved with the crowd and remember to have fun." 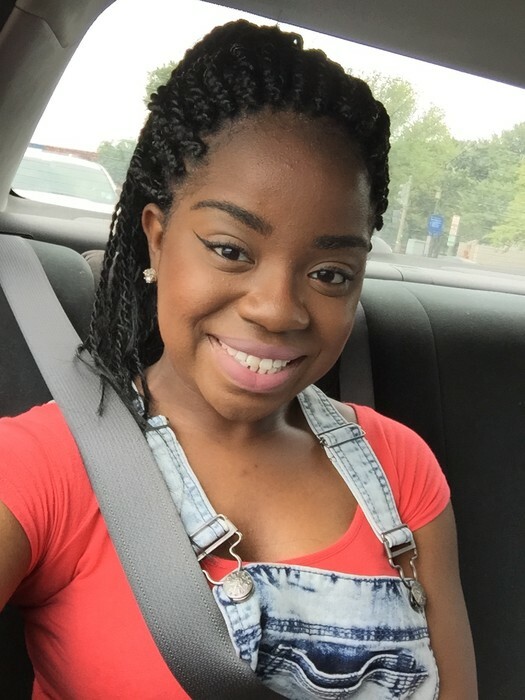 JaLesa is going to the University of Alaska Anchorage for a couple years for nursing and then plans to transfer out of state to become a pediatric nurse and then eventually a pediatrician. As far as her experience in YAHA, JaLesa appreciated, "working with different people from different cultures and communities. I learned a lot about leadership and being more open." Her advice for future members is that it's helpful to, "manage your time wisely, communicate, and stay involved." Kayla graduated on May 21, 2016 from Unalaska City High School. 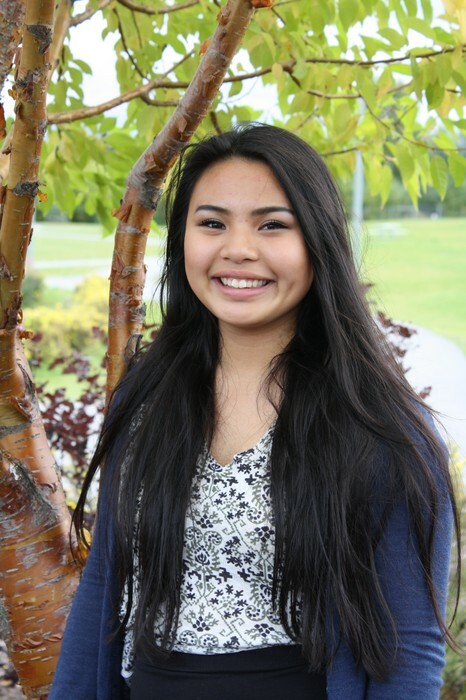 She applied to Seattle Pacific University, Western, and Seattle, but decided to go to Bellevue Washington for pre-nursing and a minor in business. 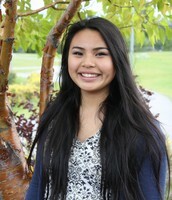 She hopes to get into the nursing program at Western Washington. "Alaska’s too cold for me." 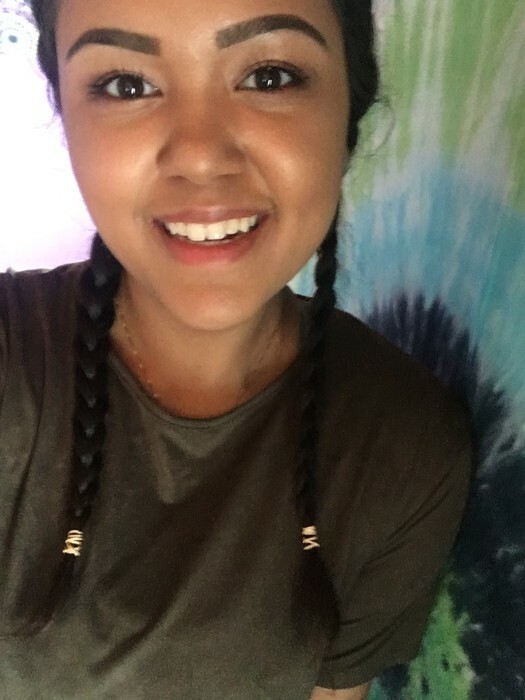 Kayla plans to enter the medical field and was benefited by her experience in YAHA because, "it gave me a different public perspective of health and ties the medical and public health pieces together." When asked about what she would have done differently if she had to do high school over, she said, "sophomore and freshman year I had really good grades. I had a job last year at the pool and had harder classes which affected my grades. I was involved in too many things; I would balance my schedule better and increase my time management skills." "Stick with what you’re interested in, manage your time wisely, don’t get overwhelmed, maintain a good GPA and stay focused so that you can look at your transcript, when you are applying for colleges and be confident that it will look good." 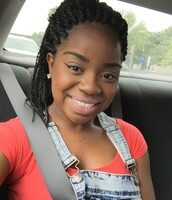 For YAHA members, Kayla suggests that you will have more success as members when you, "balance your schedule, make time for the teleconferences, show up to meetings, be aware of public health issues, and share what you learn with the teen council and other youth groups (and in the reverse as well)." 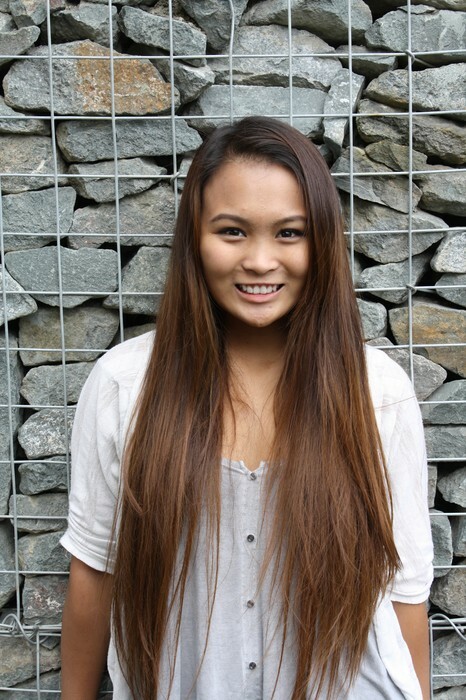 Lynette graduated on May 21, 2016 from Unalaska City High School. 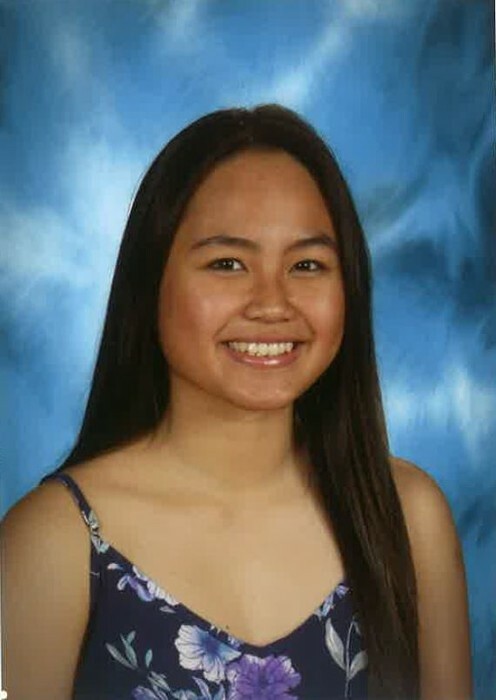 She was not able to complete her senior interview, because she was preparing for conferences, working three jobs, submitting college scholarships and working on a national application. She is also attended the Alaska democratic convention as a delegate. 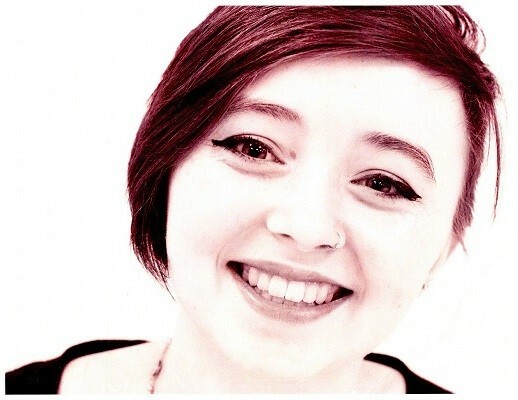 During the final YAHA meeting of the year, Lynette had this to say about her YAHA experience, "in my two years as a YAHA member, I’ve learned a lot about public health and the importance of it. We have a lot of resources and supports for such a small population. I am pursuing an education in public health." Lynette really appreciated the other YAHA members as well, as they were, "willing to participate and promote change, because they want to not because they have to." 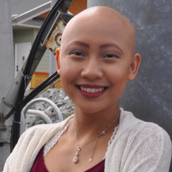 Lynette thought the most valuable parts of her YAHA experience were, "working with other youth, having a supportive adult, and the skills I acquired." "Thank you all for participating and communicating; having passion about what you care about is inspirational and reminds me why I have my passions as well. I am really happy I got to meet all of you!" 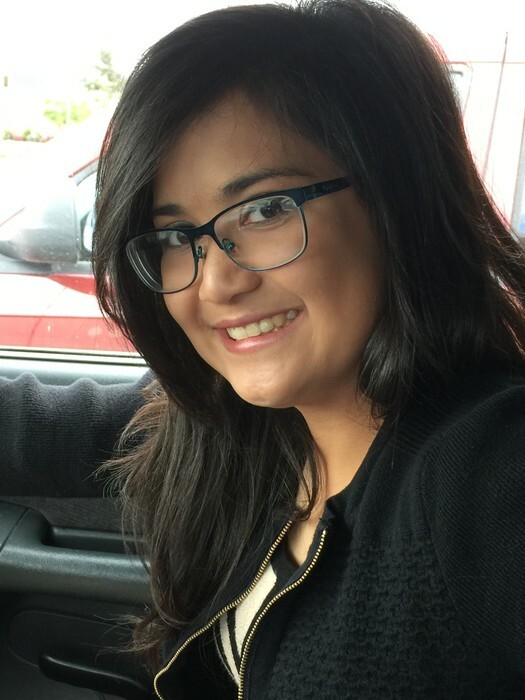 Misha graduated from Sitka High School on May 23, 2016. He will be attending the University of Utah in Salt Lake City, studying Chemical Engineering and pharmaceuticals. If he were to do high school over again, Misha says he would, " have more quickly tried new things, to find my calling and have more time to develop my interests and skills." His advice for future high school students is that it's helpful to, "start thinking about college right away and think about your admissions and what will be on your transcript and don’t be afraid to try things you think you may not be interested. Know you have the option to back out if you truly don’t like it." His favorite parts of his experience in YAHA were, the "collaborative efforts, learning from peoples different perspectives, learning from people and listening to people. Wherever I go in the future, I'll think about the public health aspects in Alaska- can use it as a point of comparison as the biggest state smallest population." For future YAHA members, Misha suggests, "don’t procrastinate! Don’t wait until the last minute and do it before it’s due so you can get things done and be productive." Jessica graduated Naukati Bay High School on May 2, 2016. 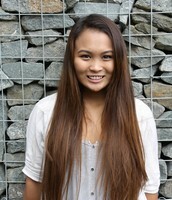 She is heading to Juneau to study geology and political science. "I would like to be a public official and insure that everyone has a voice." If she had to do high school over again, she "wouldn't worry about whether people liked me or not, because it takes too much time and turns you into what other people want instead of developing myself." 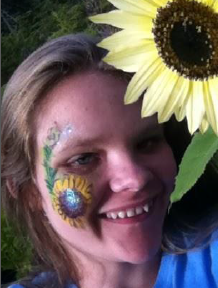 Jessica feels that her experience in YAHA really helped her develop her group skills. She thinks that success in YAHA will starts with presence, "You have to show up." Jessica's final sentiments are this, "I am really glad that my membership was accepted! I will remember the fond memories, meeting new people and making new friends." Welcome the 2016-2017 YAHA Membership! 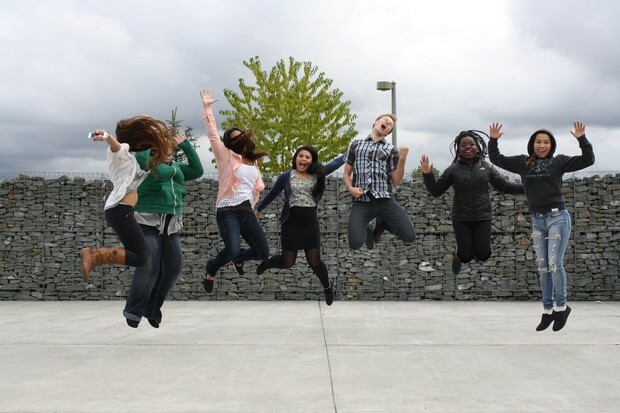 I am interested in serving on the Youth Alliance for a Healthier Alaska, because I would like to be a part of an organization that acknowledges teen health in Alaska. 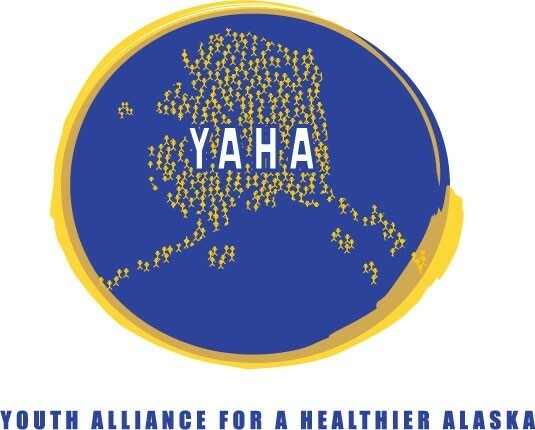 Being in an organization like YAHA is a great opportunity to help make a difference in peoples lives in Alaskan communities, and my own. Two public health issues that young people face in my community are bullying and substance abuse. In a small community, bullying is an issue that teens have to face because it’s so small that everyone knows each other, making the issues more open to other teens that aren’t involved. This then leads people to self-abuse by cutting or using drugs. I would like to help teenagers understand the situations we’re dealing with and how this can lead others and themselves to develop physical and emotional health. Youth have a unique perspective and are dealing with health issues on a daily basis, these issues are important to me and my peers. Mental health is an issue faced by young people in my community; I have begun to address this by becoming Question Persuade Response suicide prevention trained. I am seeing more programs creating a more open dialog and this will hopefully begin to address this issue. Food security is also an issue for families who struggle with consistent food sources. Partnering with farms and food banks may be a help towards solving the problem. 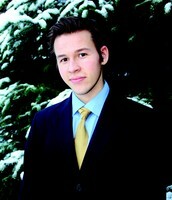 I want to make a difference in my town and other places in Alaska. I feel that it is very important that teenagers are informed about how the can prevent and help themselves in certain situations. I want to help my peers receive a healthier future. I intend to work with my local Teen Council and YAHA to address two public health issues in my community, underage drinking and the use of e-cigarettes and cigarettes. I am interested in improving teen health because no one understands teenagers better than the teens themselves, at the end of the day it's teenagers who must unite to help their own generation. I want to do my best to be a positive representation of today's youth. So many teens are out there suffering physically and mentally, silently whether its because they're embarrassed, scared or their situation hasn't been taken seriously. I would like to address mental health and self-harm by advertising resources, creating awareness, and having a booth at parent/teacher conferences. I also want to encourage our health class to discuss mental health. I'm interested in serving on the Youth Alliance for Healthier Alaska because I want to improve the health of teens in Alaska. The youth of Alaska is our future, my future colleagues, my future community members, and future leaders. Alaska has one of the highest rates of sexual assault, drug abuse, and domestic violence; I want to help reduce those statistics in any way possible. I want be an advocate for my peers who are scared, afraid to talk or ask for help. I also want the youth of Alaska to have a healthier and safer lives. I have always had an interest in helping people live healthier lives, not just in the physical nature of health alone. I want people to be able to access every resource or be able to be comfortable with every aspect of themselves so others can pursue their dreams to the fullest. I want to live my life by bettering it for those after me. 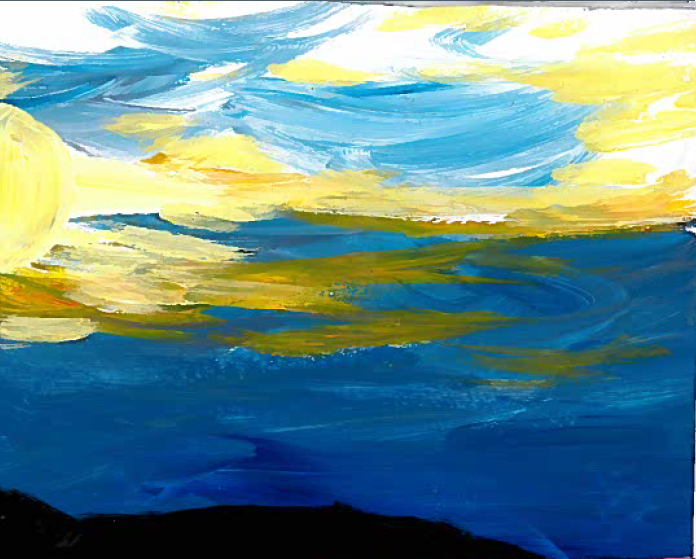 I have only recently become aware of the epidemic status of suicide among teens. I believe long term plans and policies need to be developed and access to resources needs to be more readily available, instead of neglecting the issue and wondering what to do in the aftermath. Last year, I discovered so many different organizations that help youth and leadership. I liked being able to give my input and in the public health standpoint. You see and hear public health messages and through YAHA I saw what happens in the background. I have a greater interest in public health and everyone was nice! I am interested in continuing my service on the Youth Alliance for a Healthier Alaska because I have a passion for public health. With YAHA, I have been able to become a public health advocate and I’d like to continue to be one. YAHA is a great organization and through it I’ve learned many things about the state, my community, and myself. Being a member of YAHA has allowed me to connect with a group of individuals that share the same interests as me. A topic that I feel we did not fully address last year is abuse; dating and sexual. I feel that dating abuse and sexual abuse are so prevalent in Alaska that it would an injustice not to do something about it. We can spend more time discussing statistics and coming up with ways to present these issues to our individual communities. For example, February is teen dating violence month. During the month of February, we could host dress up weeks at our schools or hold a community assembly to address these topics. When every member gives 100% commitment this session, I believe that we have the ability to create a powerful change! YAHA has already scheduled a few engagements for the upcoming session. The engagement process is easy and the team is always excited to learn more about what health related services, campaigns, engagements and opportunities are available for youth in Alaska. Please contact the coordinator if you would like to learn more about becoming a YAHA partner or to request advisory. 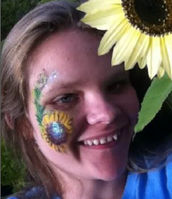 Jenny is a Public Health Specialist II in the Adolescent Health Program. 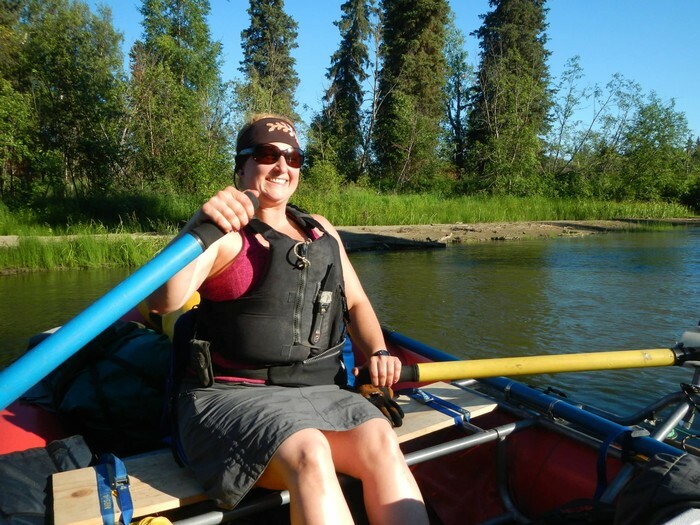 She collaborates and coordinates with communities in Alaska and nationally on strengthening positive youth engagement opportunities and in institutionalizing best practices of quality youth development within state and community programs. She received a BA degree from Alaska Pacific University in 2009. 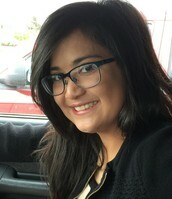 She facilitates the advisory and community intervention efforts of the Youth Alliance for a Healthier Alaska, and coordinates the programmatic and evaluation efforts of the Teen and Unintended Pregnancy Prevention program. She has previously worked in the juvenile justice and youth enrichment fields in Oregon and in Alaska. She has significant interests in sexual health education, peer education, and health equity.